Panels from our exhibit "The Intersection: Untold Stories of Women of Color on the Move"
Longmeadow, MA— In honor of Black History Month, Bay Path University presents “The Intersection: Untold Stories of Women of Color On the Move.” The exhibit, on display at the on-campus Hatch Learning Commons, explores the intersecting lines of women of color on a mission to create a more inclusive community. 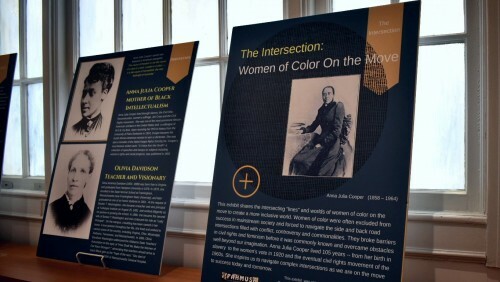 The women featured in this exhibit, many of them hidden figures, are considered pace-setters and game-changers who broke barriers in civil rights and feminism before doing so was commonly known, acknowledged or accepted. The history encapsulated in each of their stories offers valuable life lessons for every generation. “Through their untold stories, we can all learn more about history, issues, trends, perspectives, motivation and courage,” said Bay Path Professor and Chair of Undergraduate Communications Janine Fondon, who co-curated the exhibit along with Pan African Historical Museum director LuJuana Hood. “With this exhibit, we pay tribute to these women of color who broke barriers in the fields of medicine, science, art, business, music, civil rights, innovation, religion and education” stated Fondon. 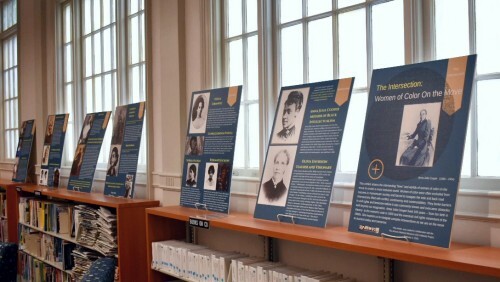 “Many of these women were "the first" and "the only", and I felt such respect for what they were able to accomplish” added Hatch Learning Commons Access Services Librarian Miriam Neiman. “I hope all community members who look at the exhibit walk away with a fuller understanding that women of color have always been a part of our story, and they have made significant contributions,” said Neiman. 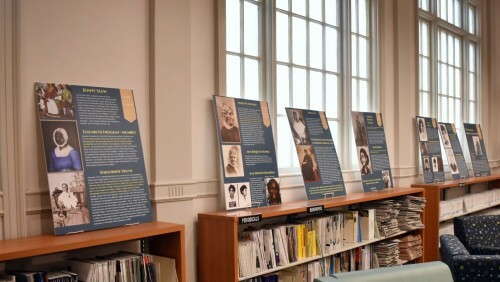 The full exhibit includes 31 women highlighted in 13 panels, and is on display at Bay Path’s Hatch Learning Commons until February 28. It is open to the public. For more information on the exhibit, contact Professor Janine Fondon, jfondon@baypath.edu. Bay Path University was founded in 1897. With locations in Longmeadow (main), East Longmeadow (Philip H. Ryan Health Science Center), Springfield (MA), Sturbridge (MA), and Concord (MA), Bay Path’s innovative program offerings include traditional undergraduate degrees for women, The American Women's College on-ground and online, the first all-women, all-online accredited bachelor’s degree programs in the country; over 25 graduate programs for women and men; and Strategic Alliances, offering professional development courses for individuals and organizations. Bay Path’s goal is to give students confidence in the fundamentals of their chosen field, the curiosity to question the ordinary, the leadership to show initiative, and the desire to make a difference.